How do you pray when you are angry? How can you pray for those who oppose you? When I can’t find my own words, the traditional prayers of our Catholic faith can help. When I was going through my divorce, I had a very difficult time praying. I wasn’t sure of the words to use. I faced a lot of anger, fueled by gossip and detraction (the sin of revealing another person’s faults to a third person without a valid reason). Dealing with my children’s hurt and confusion also contributed to my inability to pray. I began to realize how much this negativity was having an effect on my life and the lives of those around me. I often became consumed with my own feelings of anger, resentment, and bitterness. While I needed to accept responsibility for my part in the breakdown of my former relationship, I knew that receiving the Sacrament of Reconciliation and seeking reparations for any past sins would not be enough. I needed to be at peace with myself, and I had to let go of anger, period. 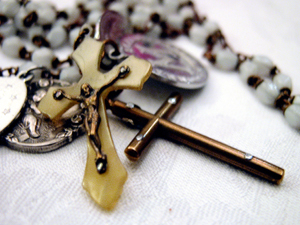 Most Catholics would agree that the rosary is one a powerful prayer. In fact, some say it is a spiritual weapon against evil. Praying through Mary to Jesus helps us to place our trust in Mary as the Mother of the Church as well as the spiritual mother of our children. Praying in this way also keeps us humble and reminds us that we are only caretakers of our children, who belong to God. Keeping the structure of the rosary intact, I added the following intentions for each decade. First Decade: Praying for your children first is important because they are the innocent victims of divorce. Placing their intentions and needs first in prayer helps you to do the same in daily life. Second Decade: Praying for your former spouse is probably the most difficult to do. I realized that the best way to deal with my anger, guilt, and suffering was to pray for her. Praying in spite of hatred or when someone tries to turn your children against you is difficult, but it is also powerful. I believe it is important to do this toward the beginning of the rosary as a way to let go of anger and find peace. This decade can indeed be the most difficult to pray, and I’ve often found myself resisting or even getting more angry as I prayed. But the formal structure of the Rosary helped me stay on track and have the words to pray. This decade also can be the most humbling because you need to pray for your former spouse without prejudice. That is, you aren’t praying for a particular outcome; instead, you’re just praying for that person! Third Decade: Praying for friends and family who have drifted from you because of divorce is also very challenging. Jesus said to pray for your enemies and for those who persecute you. With divorce, many people feel the need to choose sides. People often lose friends and family, especially in-laws and the extended family of the former spouse. Like in the second decade, praying for forgiveness, acceptance, as well as another person’s intentions (and not yours for them) is important for true peace. Fourth Decade: Praying for your new relationship and/or the family and friends who have stuck by you. Praying the rosary should not be only about grief and sadness. It should be a prayer of thanksgiving as well. True friends stick by you, call you out when you do wrong, but love you anyway. We should thank God for friends like this. Fifth Decade: Praying for your needs and intentions last is a form of humility. Being humble can keep your mind clear of anger and bitterness as you pray to God for your needs. As I stated in Catholic Prayer Book for the Separated and Divorced, “Praying for those whom you love and those who love and support you is easy. Praying for your former spouse and those affected by your divorce can be challenging, and at times, seems to be impossible. Praying through this difficulty can be a sign of healing and forgiveness.” If you are separated or divorced, I encourage you to give this a try. If you know of someone in this situation, consider passing this along to that person. This form of the Rosary has been a great help to me. I hope it can do the same for others in my situation. David Dziena holds an M A. in Pastoral Theology from St. Joseph College in Maine, and has worked in catechetical ministry for over 20 years. He is the co-author of the Catholic Prayer Book for the Separated and Divorced (Our Sunday Visitor). After receiving an annulment, he was married in the Church last year to Catholic author and editor Gloria Shahin. He has four children from the previous bond.